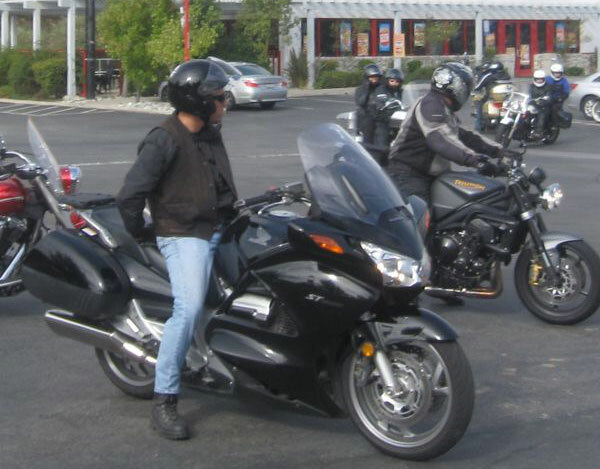 Three full weeks is a long time for a motorcycle rider to go without riding. Somehow, the planets must have aligned just the right way for me to finally to get out. The fact is that the planets had aligned the right way three weeks ago when we got the call we had been waiting for the last several years. A perfect kidney matching the right blood type and tissue type was available, and I rushed my wife to the hospital. After a week there, Lisa was discharged and has been recovering well. Adjusting to the new medications have been rough for her, and the staples holding the incision together keep snagging on her clothes. But she finally seems able to walk through the house and take care of herself. "So when you do think you'll be able to get out for a ride?" a friend of mine asked. "I don't know, maybe soon. Depends on how she feels." I said. "I don't know, probably too soon. Maybe next week." So, I get a message from his wife offering to stay at my house and keep Lisa company while I go out riding. I asked Lisa if that would be OK with her. How could she say no after I've been waiting on her the past few weeks? Eight of us left Temecula headed over the Santa Rosa Mountains and down into the Coachella Valley and over to Palm Springs for lunch at the Blue Coyote. It was a great time, just like the old times, good riding and lots of laughs. On the way home, Mike's bike decided to quit. We called Tracy (who was keeping my wife company) to bring the truck and bike ramps. By the time she got there, it was getting dark. Jack wanted to take Hwy 243 back home. If you don't know about this road, it's only one of the best roads in all of Southern California for motorcycling. 30 miles of 30mph sweepers that winds it way up the San Jacinto Mountain range taking you through Idyllwild and on to Mountain Center. Except Jack and I rode it in the dark, and we doubled up the speed to 60mph. By the time we got to the top, it was fogged over. I think I slowed it down to just 55mph. And I still have on the same set of tires I rode to Alaska with last June/July. A little over 13,000 miles on a set of Michelin Pilot Road 2's. They're right at the wear bars, but that only means I still have some decent tread left. The funny thing is that when I left home that morning, Lisa pleaded with me to be extra safe, and so I set out with a frame of mind to just lay low and take it easy. The last time she was stuck at home for medical reasons, she was recovering from radiation therapy for thyroid cancer. I left home on a ride that day and crashed my bike and was laid up in the hospital for eight days. Lisa went nuts not being able to leave home to visit me. But somewhere along the way yesterday, everything seemed to come back to me and just fell into place. You start out trying to take things conservatively, but the road has a way of bringing out the real you.